Watertech uses only air injectors with built-in brass check valve protection. The check valve opens and closes when the blower is switched on or off preventing water from ever entering into the air system (pipes, blower, manifold, etc).Many manufacturers to avoid using expensive air injectors with integrated check valves, either use an injector with no check valve or the drilled hole and channel method. The drilled hole method is comprised of drilling holes through the tub and into an air channel that is fiber glassed onto the bottom of the tub. They refer to the drilled holes as injectors or air jets, which they obviously are not. The drilled holes allow water to flow into the air system when filling and emptying the bath, which is not conducive for good hygiene. Each Watertech injector has 7 air ports that release air into the bath. For example, our model 6032 Elite has 27 injectors releasing air through 189 air ports. Each Watertech air bath is equipped with a 1 HP, 800 watt variable speed heated blower and electronic keypad. Blower and keypad carry Lifetime Warranties. One minute purge cycle that activates 20 minutes after blower is turned off. 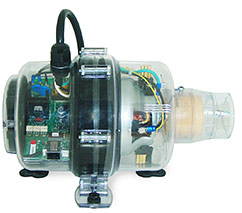 Most manufacturers use a limited warranty single speed blower with an on/off button. Single speed or three speed blowers do not provide the variety or intensity of massages that a variable speed blower does. *Attention: Purge cycles on blowers were designed to dry the air systems components of any moisture after the bath is drained. Purge cycles were not designed to blow water out of an air bath that uses an air channel system that filled with water because no air injectors with check valves were used. An extremely important fact that is never mentioned is that if, is also used as a shower, water used during showering fills the air channel. Bowers do not have purge cycles to remove shower water from air channels. To insure the highest level of hygiene, only high quality FDA approved food grade piping is used to supply air to Watertech air injectors. Water never enters the air lines because Watertech uses only air injectors with integrated check valve protection. 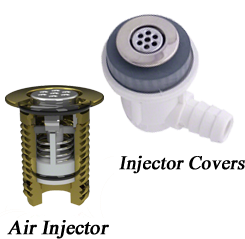 Other manufacturers often use the inexpensive air channel systems that have no air injectors or check valves to keep water out of the air channel. Channel systems are manufactured out of pieces of pipe cut in half that are fiber glassed into the tub structure . . . cheap but problematic. Holes are drilled from inside the tub into the air channel to allow air to be blown into the tub when the blower is activated. Unfortunately water fills the channel both when the tub is filled and emptied. Even if the bath has a purge cycle it’s impossible to blow all the water trapped in the channel out after each use. The trapped water then stagnates and re-enters the bath the next time it’s used. Purge cycles were developed to dry moisture that may have developed during use from the air bath components — not remove water from air channels that are flooded. Service on Watertech air lines, if ever needed, is as simple as removing the air lines from the injector. Injectors are also easily serviced by removing the injector cap. Servicing an air channel that is encapsulated by fiberglass into the tub structure is virtually impossible and would require grinding the fiberglass off the plastic pipe pieces that are used for the air channel. Each Watertech whirlpool comes equipped with a structural steel base which will not bend or warp like plastic and wood bases. Our steel base insures a rigid tub bottom and a motor mounting platform that will insure that the motor doesn”t vibrate and become noisy. The use of mortar beneath the tub bottom (as codes require) is easily accomplished with our steel base. Tubs with wood or plastic bases make it difficult to use mortar which insures a solid tub floor. A spongy insecure and unstable tub bottom can lead to cracking. An air manifold is installed on each Watertech air bath to distribute air to the injectors. The manifold has 2 additional check valves incorporated into its design to insure water never reaches the blower should an injector fail. The manifold provides equal air pressure and volume to all injectors, unlike a channel system where the first jet has more air pressure and volume than the last. A channel system is not a balanced system and does not use an air manifold, and is another cost cutting method that affects performance.